This small bird is dark brown-grey on the upperparts, with streaks on the belly, a white throat, and has a distinctive orange dot on the cheek if seen close enough. They climb trees in the usual treecreeper way. Their call includes a series of high piping whistles. This species is found in several different habitats along the east coast of Australia, including rainforest. In the tropical rainforest, it seems common only at much higher altitudes. 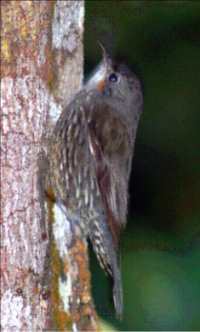 These rainforest populations look different from those individuals in south-eastern Australia; they are generally smaller and darker, and have less white on the throat. They are thus considered a separate race (minor) known as the ‘little treecreeper’.